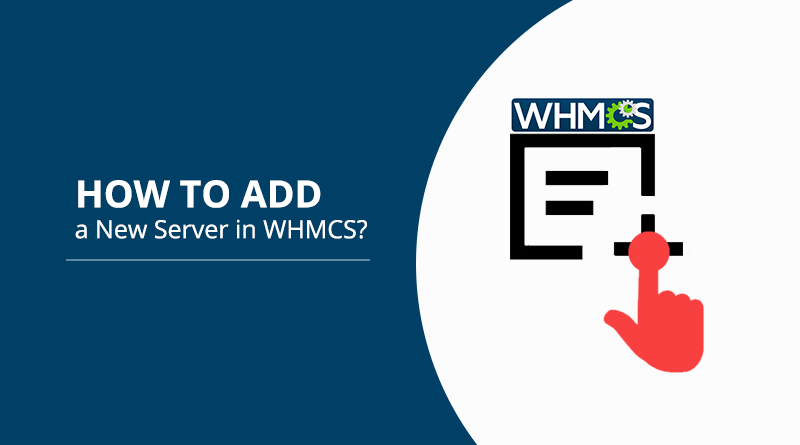 How to Add a New Server in WHMCS? 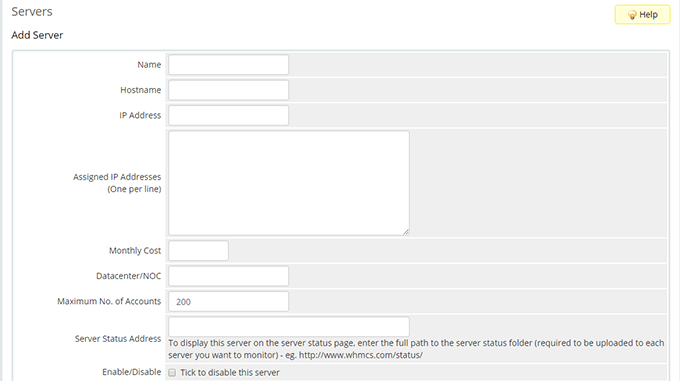 You can add servers in WHMCS via the admin panel. 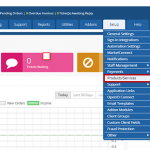 It will help to add the new accounts and track in WHMCS. 1. Log in to your WHMCS Admin dashboard with your login details. 3. 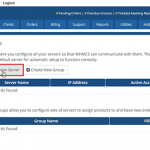 In case, it is your first server in WHMCS, you won’t see any groups or servers. a. A group can be created for adding more servers in future. 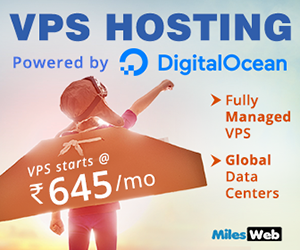 This will help you to have multiple servers to distribute clients. You can always add them later. b. Select “Add New Server”. a. Name: It is the name of your server. Since this is internal, the name will be viewable to only you and your team. 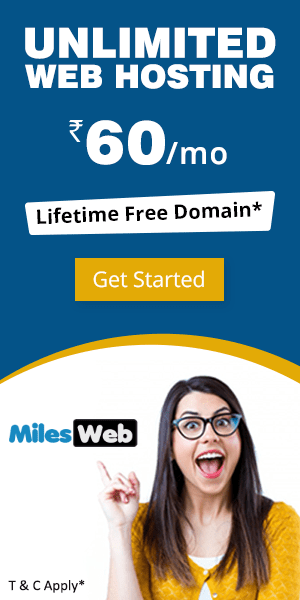 b. Hostname: It is always better to match the hostname with your MilesWeb hostname so, that you can easily find a particular server, when you have multiple servers. c. IP Address: Here you will need to insert the primary IP address of your server. You will find the address by logging in to Manage (link). Copy the IP from the server you are adding. 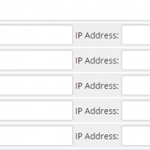 d. Assign IP Addresses: If there are multiple IP addresses on your server and you want WHMCS to be assigned across them, you will enter them here. e. Monthly Cost: This field helps you to monitor cost of server internally. You can always find this in Manage, or by contacting our Billing Department. f. Datacenter/NOC: In this field, you can specify internally. MilesWeb allows you to select the data center location from India, US and UK. g. Maximum No. of Accounts: When you set a “Maximum No. of Accounts”, it will set a limit on the server to offer more than that number on a single server. This can be modified as per your requirement and this field is basically for internal stock control of shared accounts. You can easily view it in the “Servers” page after the completion of setup. h. Server Status Address: This directory’s location will depend on the installation. In general, it is within the install directory, so, if you install it to /public_html using Softaculous, the “Status” directory will exist at www.domain.com/status. If you install it to a directory, i.e. /public_html/whmcs it would be at www.domain.com/whmcs/status. a. Primary Nameserver / IP Address: This IP address will be assigned to new accounts that get signed up. b. Secondary Nameserver / IP Address: Same as above. c. Optional Third/Fourth/Fifth Nameservers: Same as above. a. 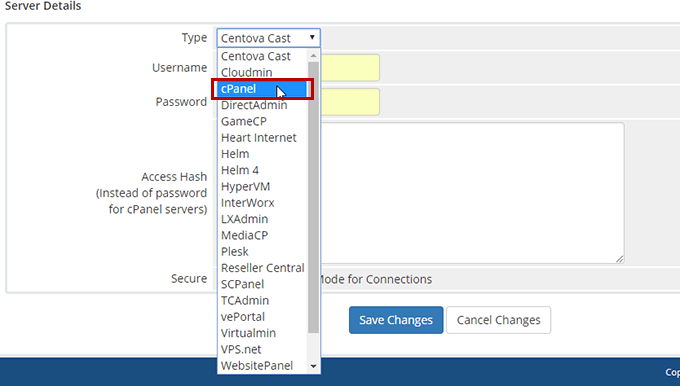 If it is a Fully Managed MilesWeb server with cPanel/WHM, you will have to select the “Type” as “cPanel”. B. If you use the “Username/Password”, see to it that the API Token field is left blank. If you prefer to use the API token, you will need to create a new API token by logging in to WHM and going to “Manage API tokens”. i. Here too you will need to enter the username assigned to the API token. ii. Leave the Password field empty. iii. Enter the new API token. b. 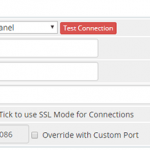 In case you are using SSL, you will need to “Tick to use SSL Mode for Connections”. 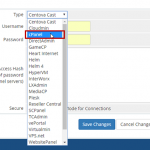 c. In case, you are using a custom port, select to override and enter the port. Or else this will read 2086 for standard, 2087 for SSL. a. This is where you set up Single Sign On for your admin dashboard. It means there will be a single sign on from servers to get into WHM. If you are allowing your “staff” to log in to your admin dashboard but you don’t want them to have access to that, you can adjust the settings here. If you are the only one to use WHMCS or if you want your staff to have complete access then you can leave it unrestricted. 8. At last, select “Save Changes”. Congrats! You have now set up your first server and you can begin with setting up the products that you want to resell. How Can I Optimize My Reseller Account? Is Overselling Allowed With Reseller Packages ? 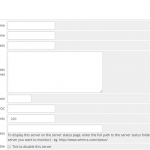 What is Apache Tomcat Hosting?